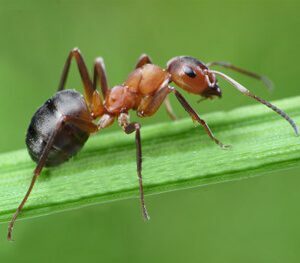 Most of us know that summer is the prime season for insect invasions and also pest control, but many common household pests do not go inactive during the winter. As the temperatures begin to drop and winter arrives, many pests are on the hunt for the warm shelter. Very often that will be a house, and sometimes it will be yours. In this post, we will list the most common pests that may move indoors during the winter and also tips to prevent them from getting inside. 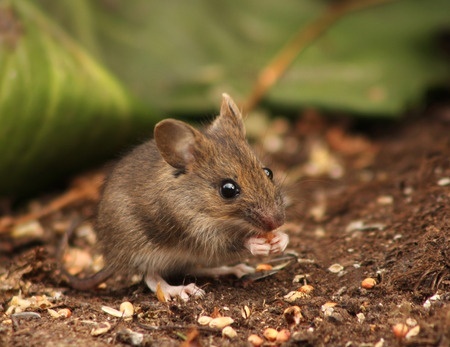 House Mice – The house mouse is the most common pest that will enter a home during winter. They like to find a dark and quiet area like a basement. Mice can cause severe damage to your property by chewing through walls and electric wires, which can result in a fire. A mouse can fit through any small open area, cracks, or holes in your home exterior. You should always inspect the outside of your house every fall and winter. Cockroaches – German cockroaches commonly stay in the tiny areas near to moisture or food. These insects often hitchhike into our houses inside groceries bags or any kind of boxes. Cockroaches can spread bacteria easily. 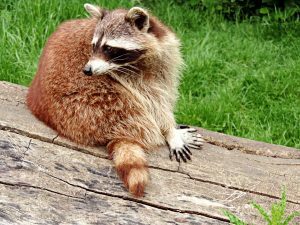 Raccoons – Raccoons will move into homes (especially attics) during the winter in search of shelter. They often enter through a chimney or any opening in the soffit or upper level of a house. They can carry rabies and their feces can carry diseases as well. Always have a cap covering your chimney or any other vents to prevent entry. Trim the branches around your home, especially near roof level. Repair any loose siding or soffit. 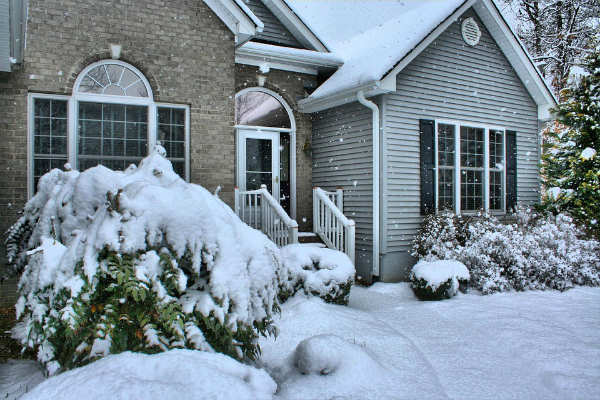 Related Post: Why do pest control in the winter? Spiders – Spiders prefer to spin webs in undisturbed places such as closets, attics, crawl spaces, and basements. Most spiders in Chicagoland are harmless, but the brown recluse spider is poisonous. It can be found inside of cardboard boxes, alongside window moldings, and in seldom-used clothing and shoes. Keep trees and shrubs trimmed away from the home. Pet cats are great at keeping spiders and insects away. Keep low traffic areas swept and clean. There are many scented natural oils (citrus, peppermint) that naturally keep spiders away. The most important reason for pest control in the home is because of health. Many pests can carry disease, and some of them can be very serious. 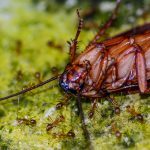 Pests also reflect badly on your home because no guest is ever impressed if they see a mouse or cockroach in your house. If you can’t seem to keep them out of the home, it’s time to call professional pest control. 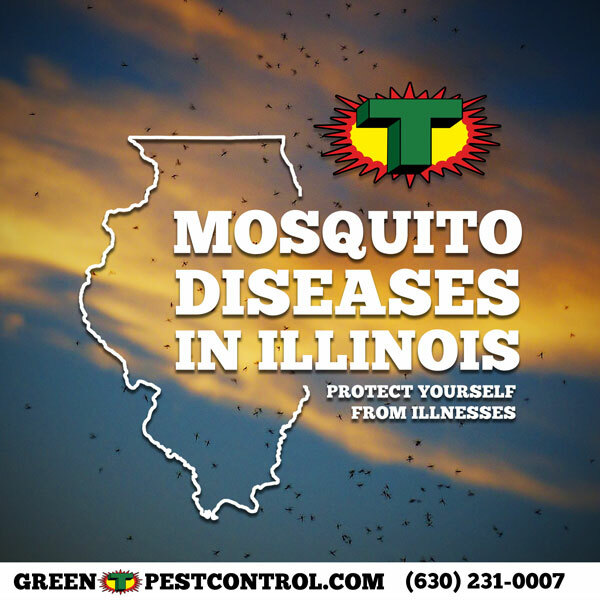 In this post, we will inform you on the most common mosquito-borne diseases in Illinois and what kind of symptoms you can expect. West Nile Virus (WNV) is the most common mosquito-borne disease in Illinois. Luckily it is not contagious and does not spread from person to person or from animals to people. In 2002 there was an outbreak of the virus in Illinois that resulted in 884 human cases of the disease and 66 of those cases were fatal. West Nile Virus usually cycles between mosquitoes and birds, but occasionally humans and other mammals will contract the virus. Certain bird species such as Crows, Blue Jays, hawks, and eagles are highly susceptible and usually ends in mortality. Horses are also susceptible to WNV infection, but a vaccine is available through veterinarians. Cases of the illness in dogs and cats are very rare. Unfortunately for us, there is no cure for the West Nile virus for humans. People of all ages can get sick from WNV, but 4 in 5 people will show no symptoms. For those who are affected will experience flu-like symptoms, such as fever, headache, body aches, swollen glands, and muscle weakness. The symptoms can last days or even weeks so medical attention should be sought immediately. Most people infected with the Zika virus will not show symptoms, for those who do, the most common symptoms are fever, rash, joint pain, and conjunctivitis (red eyes) and should not last longer than a week. Because of the lack of symptoms, travelers returning to the US should take preventative steps for the next 3 weeks from mosquito bites so they do not spread the virus. Government agencies in Colombia, the Dominican Republic, Puerto Rico, Ecuador, El Salvador, and Jamaica advised women to postpone getting pregnant until more is known about the risks. Zika can spread from a pregnant woman to her baby. Those infected with the Zika virus during pregnancy are at risk of causing the birth defect of the brain called microcephaly. Other problems in babies before birth may be defects of the eye, hearing deficits, and impaired growth. LaCrosse Encephalitis (LAC) is primarily found in central and northwestern regions of Illinois. The majority of LAC cases are mild and less than 1% of those cases are fatal. In very severe cases it can take five to fifteen days to notice the symptoms, which include nausea, vomiting, headache, seizure, coma, and brain damage. Children under the age of 16 are most susceptible to this virus and, just like other mosquito-borne illnesses, LAC can not be transmitted from person to person. The eastern tree hole mosquito is a carrier for this disease and normally develops in water filled cavities in trees or artificial containers just above the waterline. 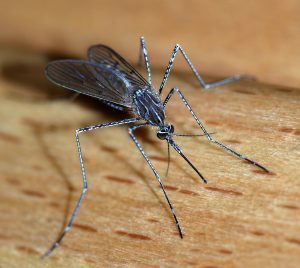 The adult mosquito is very aggressive and generally stays near its food source. Cases of St. Louis Encephalitis (SLE) are very rare in people but the disease is still circulating in some mosquito populations. This virus can cause illness in people, horses, and certain types of birds. For the one percent of people infected by this disease, symptoms start to show 5-15 days after the bite. The disease starts with fever, headache, dizziness, and nausea and typically gets worse over a period of a week and then spontaneously resolves. There aren’t any vaccinations for these mosquito-borne diseases, so it is up to you to take preventative mosquito control measures to protect yourself and your family from mosquito bites throughout the summer. Do you want a professional pest control expert to get rid of mosquitos for you? In this post, we talk about controlling Japanese Beetles in your garden. We discuss identification, life cycle, damages they cause and what to do about it. Japanese Beetles are a common nuisance insect in the Chicagoland area and across the United States. These invasive pests from Japan arrived in the North America in the early 1900s and since that time has spread to almost the entire United States. In Japan, they are less of a problem because they have many natural predators that help keep their population down. In the U.S. that is not the case and they are well known for their appetites for green leaves, roses, and garden plants. 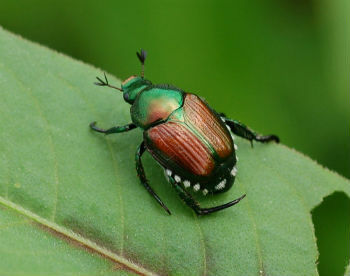 Japanese beetles are known to feed on over 200 species of plants. Commonly identified by its unique coloring, the Japanese beetle appears as an emerald dark green to black. The brown near the top of this insect gives its identity away. Noticeable grooves along the length of this area are also very distinct. It has small white tufts of hair that seem to project from its abdomen. This species of beetle have a life span approximately around 30-45 days. The Japanese female beetle feeds, mates and lay one to five eggs, 2 to 4 inches deep in the soil, every 24-48 hours. Prior to the insect’s export, it was known to occur only in Japan, where it’s not a major pest problem. Entering the United States in 1916, the coppery-green beetles were hidden in a shipment of irises from Japan. Known to occur only in Japan prior to the insect’s export, and were not considered a major pest problem in its native habitat. Well established populations happen most heavily east of the Rockies, and in the Midwest, and are still invading the United States. On the West Coast, small pockets have been identified. Conquering geographical barriers, they hitch rides on vehicles, freight, or even air cargo. 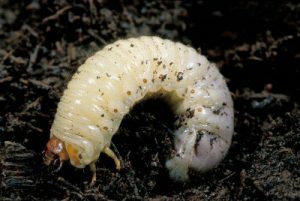 Grubs and eggs can also travel in the soil of nursery stock. Adult beetles with strong flying abilities enable them to infest areas several miles away from the soil they emerged from. More often than not, they only fly distances that are close between feeding and egg-laying areas. 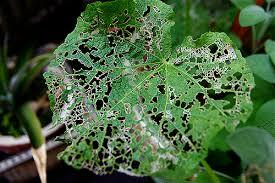 Certain plants are favorite targets of the Japanese Beetle, however, they do feast on over 200 plant species. Some of their favorite dinner options include roses, hibiscus, grapes, raspberries, linden, sassafras, Japanese maple and Norway maple. A few of the plants that they seldom damage include boxwood, red maple, flowering dogwoods, hollies, magnolias, and lilacs. After the eggs hatch, Japanese beetles will be in a larval stage and live in the ground just below the root level of the grass. In this phase, they are a well-known yard pest known as “white grubs”. Before these destructive pests are even eating your plants in their adult beetle form, they are eating your grass roots and damaging the grass in your yard! Grubs devour grass roots, making it impossible for the plant to absorb water and ultimately kills the grass. They are the nation’s No. 1 turf pest and cause irregular brown spots in your lawn from the feeding grubs. They also attract animals to your yard such as skunks, moles, and raccoons who feed on them and will dig up the soil in search of the grubs. This destructive life cycle from birth to adult creates a constant chore gardeners to defend against. If you want to get rid of Japanese beetles, you may need to use more than one method to be successful. You will want to control not just the ones eating your plants but also to attack the grubs that are living in the soil and will be giving you problems in the future. You may have already tried hand-picking the beetles from off of your plants. You can remove them right off the leaves because they are slow and do not sting, and then drop them into a bucket of soapy water. Early morning is the best time because the beetles are less active. This method can help you ease the damage in the short term but will not be effective in the long run. 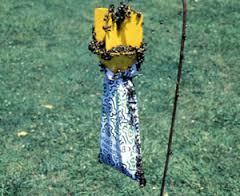 Another quick short term method of Japanese Beetle control is to use special Japanese Beetle traps. These will attract beetles in your yard into the trap where they won’t be able to escape. Don’t place the trap to close to where you are having problems because the scent of the bait in the trap can attract more beetles to your plants. Find a good location and leave the beetle trap their for a couple days and then remove it. Repeat this process every week or two. Then next method you’ll want to try is to spray your affected plants with a product such as Japanese Beetle Killer (pyrethrin) or Neem, at the first sign of attack. Using a pyrethrin-based insecticide will be the safest and most effective way to combat them. This should help you control the Japanese beetles feeding on your vegetables, roses, flowers, and shrubs. Neem Oil is a natural antifeedant derived from a tree that when sprayed on plants, reduces feeding. Finally, you will need to attack the beetles in their larval form in the ground. If you don’t, you can be sure a new generation of beetles will replace the ones you’ve already removed. This will also help protect your grass from being eaten and destroyed by them. A product called Grub Guard will eliminate grubs. When applied in the Spring, it will diminish them before the beetles emerge. Milky Spore is another product that kills grubs. After a year or so, the chemical will keep working for 10 years or more. Using a combination of methods gives you the best opportunity of controlling the Japanese Beetles and you should start to see fewer of them over time. We hope this helps save your plants! 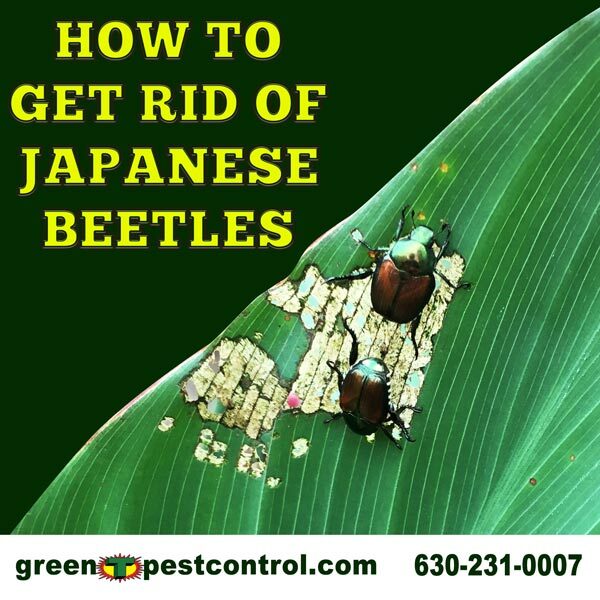 Do you want a professional pest control expert to get rid of Japanese Beetles for you? 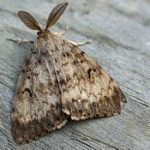 In this post, we talk about the Illinois Gypsy Moth quarantine, the counties affected by it, and the signs and symptoms of a gypsy moth infestation. 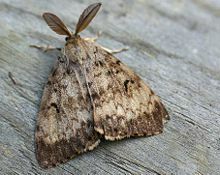 Four more counties have been placed under quarantine by the Illinois Department of Agriculture to control the spread of the Gypsy Moth, an insect that destroys trees and shrubs. The invasive moths can strip trees bare of their leaves, causing tree death. The original quarantine began in Lake County in the year 2000. The destructive moths have continued to spread to neighboring counties in Illinois. The counties added to the quarantine are Kendall County, Kane County, LaSalle County and Will County. These four counties will join Cook, DuPage, Lake, and McHenry counties in the department’s quarantine order. What Does the Gypsy Moth Quarantine Mean? All nursery and lumber products will need to be inspected or certified moth-free before they can be moved out of the counties. Residents in those counties must personally inspect vehicles, tents, outdoor lawn furniture, bicycles and other outdoor items for gypsy moth eggs, live moths and or caterpillars before taking them out of the quarantine zone. If you are caught illegally removing items from the quarantine area you may be fined up to $500, and the items will be confiscated or destroyed. 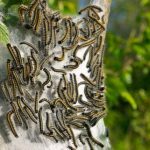 According to the United States Department of Agriculture, “the caterpillars have voracious appetites for more than 300 species of trees and shrubs, posing a danger to North America’s forests.” Watch out for defoliated trees and shrubs as this is most likely the sign on Gypsy Moth caterpillars feeding and destroying plants. Related: Green T Pest Alert! Gypsy Moths! 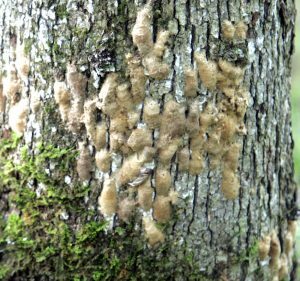 Gypsy moths like to lay egg clusters that look like fuzzy brown lumps on smooth surfaces. If you find a cluster you shouldplace it soapy water. 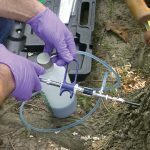 In Illinois there are two treatments that can be dropped by helicopter, BtK – an organic bacterial spray that targets caterpillars and is harmless to people and pets. Another treatment uses biodegradable plastic flakes laced with pheromones and is used to confuse male moths and disrupt their mating. 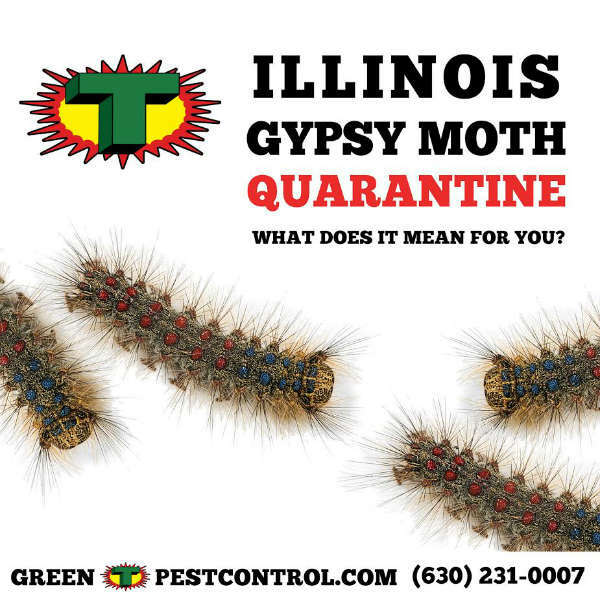 Call Green T Pest Control (630) 231-9997 to request a free commercial or residential gypsy moth control estimate today! 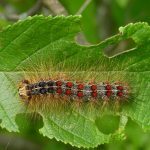 Green T Pest Alert: Gypsy Moths! Gypsy moth numbers are on the rise. The increase in numbers have the Illinois Department of Agriculture (IDOA) changing it’s strategies from last summer. The new increased efforts by IDOA included a Gypsy Moth Quarantine. IDOA’s goal with the quarantine is to reduce the populations and slow the spread of the Gypsy Moth. You can read more about the quarantine and whether it affects your county on the Illinois Department of Agriculture website. Now as your local pest control company, we at Green T want to inform about the gypsy moth, and the damage that it can cause to your property. This will help you understand the need for the IDOA quarantine. Through it’s complete life cycle a gypsy moth will go through four different stages in life; egg, larva(caterpillar), pupa, and adult. Egg masses appear as 1.5 inch tan or buff-colored hairs, on tree trunks, and even on your outdoor furniture. A female gypsy moth can lay between 500 to 1,000 eggs in sheltered areas such as underneath the bark of your trees. 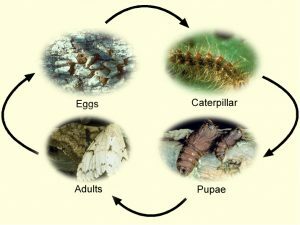 The egg stage of a gypsy moth life cycle is how the gypsy moth overwinters. In April the eggs begin to hatch into caterpillars. Gypsy moth caterpillars are one of the easiest caterpillars to identify. They have five pairs of blue dots followed by sick pairs of red dots lining the back, they are dark in color and are hairy in appearance. Depending on the age of the caterpillar they either feed day or night, which means these caterpillars are eating your trees around the clock. Young caterpillars spread to new locations by crawling to the top of the trees. Gypsy moth caterpillars enter a pupal or transitional stage. The pupae are dark brown, shell-like cases. It takes about 10-14 days for the adult Gypsy moths to emerge from the pupae. Females have white to cream-colored wings, a tan body, and a wings span of two inches. Males only have a wing span of 1.5 inches, they differ in color from the females being dark-brown and have feathery antennae. Gypsy moths only have one generation per year. Tree damage is cause by the gypsy moth caterpillars. The caterpillars move tot he leaves of trees and begin to eat, mostly at night. Feeding continues until mid-June or early July when the caterpillar enters the pupal stage emerging, finally as a moth. 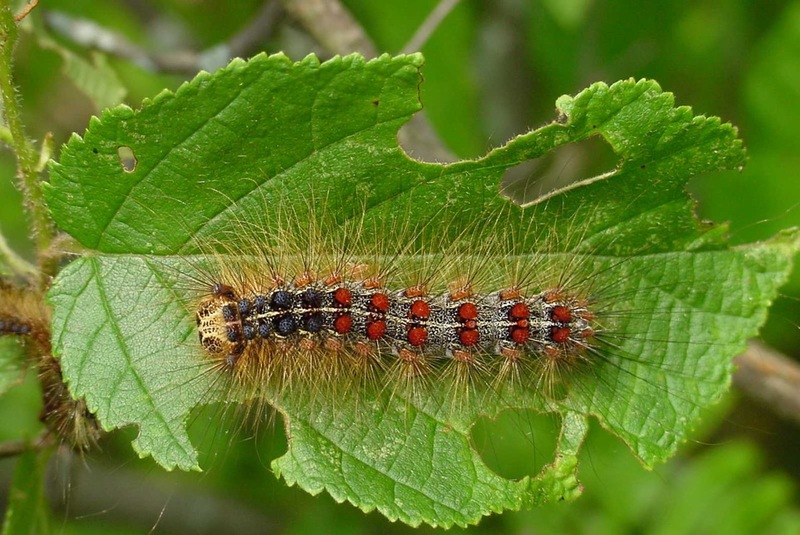 Gypsy moth caterpillars tend to feed on tree leaves of the maple, elm and particularly the oak. They will also feed on apple, alder, birch, poplar and willow trees. Depending on the degree of the Gypsy moth infestation, tree damage can range from light to almost complete defoliation. Continuing attacks can fatally weaken a tree or leave it vulnerable to other insects and diseases. Need help protecting your trees? Call Green T today to learn about our tree and shrub program as well as our pest control program! 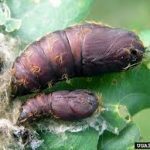 Comments Off on Green T Pest Alert: Gypsy Moths! Green T Pest Alert: Termites! This post is for informational purposes. Green T does not treat for termites. Termites are a highly specialized pest control solution which we are unable to offer our customers at this time. We apologize for the inconvenience. This is the time of year when termites make their presence well known. 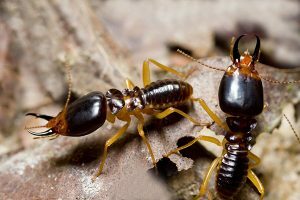 In the springtime, termite colonies send out swarms of termites, to mate and begin new colonies. Termites really pose no risk to homeowners. Their only mission is to reproduce & start a new colony. The “scariest” part of this process it’s that when they do come inside, they tend to invade by the hundreds…or even thousands! Yikes! Mud shelter tubes along exterior foundation walls, floor joists above the basement or emerging from cracks where the floor & wall meet in the garage. Piles of small, delicate wings shed by reproduction (typically found near the point of emergence & light sources). 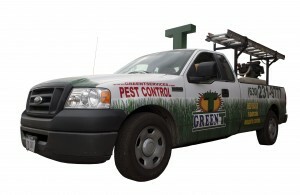 For pest control of ants, bed bugs, cockroaches and more, contact Green T today! Request A Quote or Call (630) 231-0007! Comments Off on Green T Pest Alert: Termites! We don’t have to tell how important your trees are to everything, from the condition of your landscaping to general curb appeal to your property, making it important to keep your trees and shrubs healthy. This is where a year-round tree and shrub program can be of a great benefit to your home. 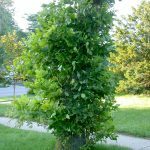 Hiring a great tree and shrub company, like Green T, will help you maintain healthy trees and shrubs, and therefore you will reap the benefits of a healthy, lush landscape. Tree service helps keep pests out. Pests can eat and ultimately destroy leaves, trunks, and branches. Dormant oil in early spring is a great preventative measure that prevents a variety of insect eggs from hatching. Maintains Balanced Nutrients. Just like your lawn, trees need nutrients so that they can retain their color, strength, and beauty. Stimulates growth. Our deep root fertilization is an injection of fertilizer directly into the root system of your trees and shrubs, promotes new growth and establishes a healthier and stronger landscape. Lower cooling and heating costs. According to the U.S Department of Agriculture, a young, healthy tree can provide a net cooling effect equivalent to ten room-size air conditioners operating for 20 hours a day! Increased property value. Very often do realtors advise you to spruce up the curb appeal of your home, when trying to sell. That’s because a lush, healthy landscape will help to increase property value. Maintain air quality. Healthy trees absorb air pollutants like carbon dioxide, sulfur dioxide, and smog as well as generate oxygen through photosynthesis. Hiring professionals to care for your trees and shrubs is one of the best decisions you can make for you lawn. Call your local professionals at Green T at (630) 231-9997 or Request a Quote! Mosquitoes pose a major risk to your family’s safety as well as the public in general. These insects are “vectors” for many diseases, meaning they can help spread deadly viruses to humans, including West Nile, Zika, malaria, and dengue. Aside from those major concerns, biting mosquitoes lead to itchy skin, swelling and additional complications. To protect against mosquitoes, there are steps you can take to keep yourself, your family, and your pets safe. As your local pest control company, we did our research and compiled a list that provides some great ideas on how to eliminate mosquitoes! When taken action against mosquitoes, personal protection is key! Use Repellents – Deet and other insect repellents do work! The CDC says their use is one of the most effective mosquito repelling tactics you can implement. Avoid Alcohol – Drinking beer and other alcohol appears to attract more mosquitoes according to the Journal of the American Mosquito Control Association. If you want to stay bite-free, don’t indulge before going outside. 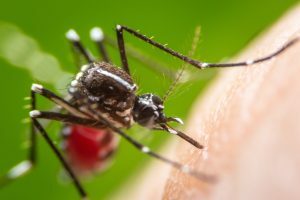 Avoid Peak Mosquito Hours – When you’re trying to prevent mosquito bites, a simple tactic is to avoid being active when they’re most active. For most mosquitoes, that’s within a few hours before and after dawn and dusk. Your pets might be suffering just like you! Handling mosquito control for pets is easy when done in conjunction with your own efforts. Apply Topical Treatments – Many topical treatments are available for your pets that provide protection from mosquitoes, fleas, and ticks. Use these as directed by the manufacturer and continue the treatments throughout the year. Fido will surely thank you! 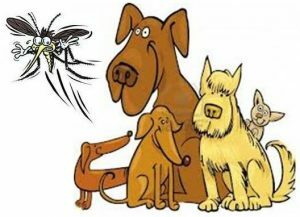 Staying indoors – Another mosquito protection for your pets is to just keep them inside where they aren’t exposed to mosquitoes. If that’s impossible, then only take your pet out in the hours around noontime, when mosquitoes are least active. Not the easy of solutions we know, but for the sake of your pet keep it in mind. Watch the Weather – Remember that mosquitoes have a hard time flying when it’s raining or in breezy conditions, so take advantage of those opportunities to take your pet outside. Mosquitoes will find any possibility to enter your home and feed off you and your family. Keep them at bay with these tips! Keep Doors and Windows Closed – Keep these pests out by making sure your doors and windows are closed! Check for gaps around them that could let a mosquito inside. Easily done when there is AC in the house. Fix Screens – Regularly check those screens for tears and rips that could allow mosquitoes into your house. Repairing them is a very simple task. The best solution for its hot in the house and need some sort of breeze to cool down. Buy Citronella Candles – Citronella candles can be hit or miss. The scents they produce do repel mosquitoes, but if the wind direction changes the mosquitoes may return. Tiki torches are another great option! Your is might be mosquito heaven, depending on your decor. Here are some tips to limit mosquito breeding sites. Eliminate Standing Water – Mosquitoes breed in standing water, so it’s important to limit these sites. Dump water that collects in flower pots, toys, tires, tarps, trays and gutters. Don’t forget to change the water in fountains and bird baths on the regular. Trim Tall Grasses – Tall grass and thick vegetation provide protective cover for mosquitoes during the heat of the day. By eliminating these mosquito-friendly plants form your yard, you can make mosquitoes fly farther for this protection. Hire a Professional – Fogging and misters can temporarily act as a mosquito repellent, but Green T utilizes pesticide methods to help prevent breed and the infiltration of mosquitoes. Green T Pest control applies mosquito repellent around the base of your home and three feet up and out from home to form a protective barrier. Call us today to find out more (630)-231-9997!! The world outside your home is itching to come back to life now that spring is just around the corner. Here in Illinois, we will start to notice of the flowers beginning to bloom and leaves are beginning to grow. It’s pretty, but with the nice comes the storm of hungry insects out of hibernation. Learn more about our residential pest control services here! Swift removal is key when you are dealing with ants. Sometimes the best course is to obtain some help from a knowledgeable pest control company, and we know just the place: GREEN T! A lesser-known but equally invasive insect, are box elder bugs. The don’t spread disease like roaches or cause structural damage like ants. But nonetheless, they are still quite a nuisance to have to hang around your yard and house. Check out this article on Preventing Pests in Your Home This Spring! According to the Illinois Department of Public Health, they tend to spend the most time in your yard, feeding on box elder trees, which can lead to unhealthy and damaged trees. One of our professional technicians may be able to eradicate a spring pest infestation and provide you with tips on how to effectively seal up the cracks on the outside of your home to reduce the possibility of future insects invasions. Comments Off on Spring Pests Alert! The names are similar but voles and moles are completely different pests. One of biggest differences between the two critters is the damage that they cause. 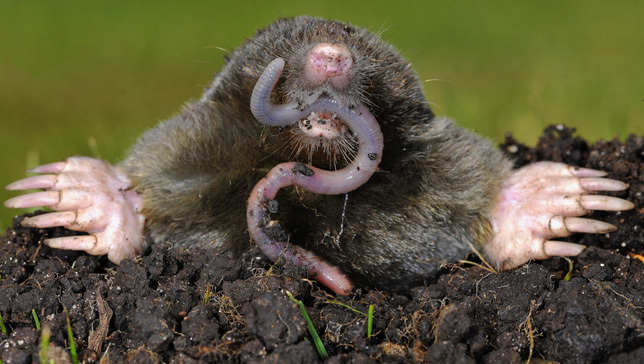 Moles are insectivores, meaning their gourmet meals consist of earthworms with a side of grubs and insects. They do not eat plants; the damage to your landscape is caused by the tunnels and runways the dig in your lawn. You will hardly see a mole, because they live and feed underground. Moles range from gray to dark brown in color, and can grow to about seven inches in length. Moles are most often identified by their long noses and paddled, webbed front feet, which makes it easier for digging their tunnels. Moles eat a lot! They eat quantities that nearly equal to their body weight every day, and their constantly digging for more food! The mini mountains all over lawn, are caused by the moles constant food search. On a good day a mole can dig 100 feet of new tunnels. Already know you have a mole problem and need help? Learn more about our pest control program here! Voles on the other hand, are herbivores, and their gourmet meals will unfortunately, consist of your landscape. They feed on a variety of plants like grass, flower roots, seeds and bulbs. Their even worse in the winter, they will feast off the bark of your trees and shrubs, when food is more scarce. Voles are rodents that look much like mice, but without the long tails. Voles only grow to about 5 inches long and are dark brown in color. They can quickly colonize an area, which makes up for that their life span is only that of 16 months or less. You can identify a vole infestation by looking for surface tunnels in your mulch, and along the walls of your house or retaining walls. If you notice damage and a golf ball size hole next to it, its a sure sign that it is vole damage. If you have a mole or a vole problem and have questions, give us a call today and we will glad answer them all!